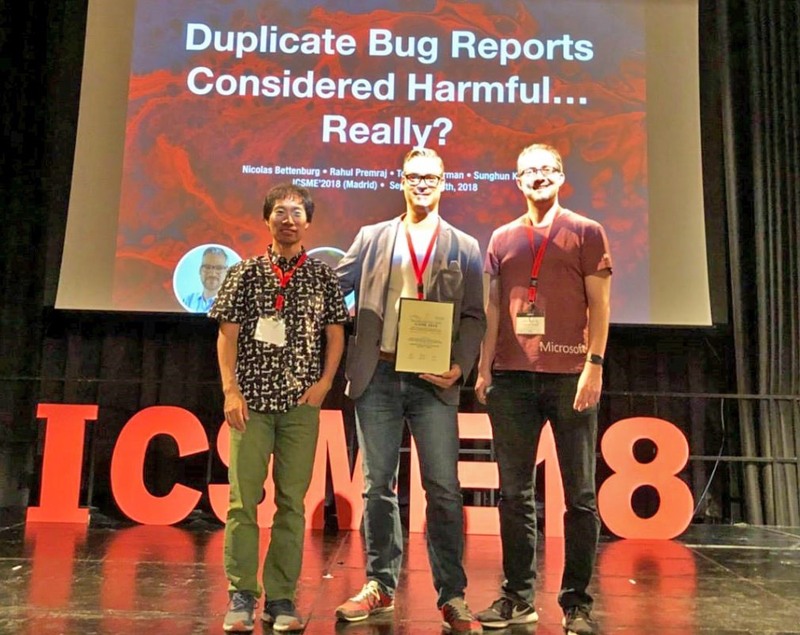 On the 34th IEEE International Conference on Software Maintenance and Evolution (ICSME 2018) held in Madrid, Spain on 23-29 September, Dr. Sunghun KIM, together with Nicolas BETTENBURG, Rahul PREMRAJ and Thomas ZIMMERMANN, were awarded the Most Influential Paper in ICSM 2008 Award with their paper "Duplicate Bug Reports Considered Harmful... Really?". The research team found that most developers have experienced duplicated bug reports and only few considered them as a serious problem. This contradicts popular wisdom that considers bug duplicates as a serious problem for open source projects. Developers also pointed out that the additional information provided by duplicates helps to resolve bugs quicker. Therefore, in their paper, they propose to merge bug duplicates, rather than treating them separately. They quantify the amount of information that is added for developers and show that automatic triaging can be improved as well. In addition, they also discuss the different reasons why users submit duplicate bug reports in the first place. Congratulations to Dr. Kim for his achievement! For more details, please visit the ICSME 2018 website.